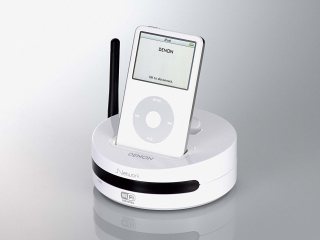 Denon has launched two new 'universal' networking iPod docks that allow internet radio and PC-based music to be streamed to hi-fi systems. The two feature-packed docks, the ASD-3W (£160) and ASD-3N (£130), enable hi-fi systems connected to a suitable screen to access music stored on iPods, PCs, Macs and NAS (Network Attached Storage), and receive internet radio. Both docks are network-compatible and offer full support with Ethernet interfaces (LAN). The upmarket ASD-3W is Wi-Fi compatible too, and boasts direct wireless network support via a Wireless LAN antenna. Denon is keen to point out that sound quality always comes first, and appropriately, the docks are said to contain high-specification D/A converters, a first-class active preamp and gold-plated phono connectors. For ease of use full remote control functionality is available from the handset included, plus there's a new full colour GUI (on-screen interface) for both products to aid integration and set-up. A single music screen lets users view cover art and track info from the iPod, as well as all streaming media, plus, of course, photos and videos from appropriate devices. All 4G, 5G and 6G iPods with the 30-pin connector - including the latest Fat Nano, iPod Classic, Touch and iPhone - can be used with the products.